When you purchase this item you are agreeing to allow us to fill your order with any cut (pork or beef) we have in our inventory that doesn't meet our exacting standards for sale at full retail price. We used to just eat all these cuts ourselves, but our volume has now increased to the point that even we, with our prodigious appetites, cannot consume all the packages that fall into this category. Typical problems that arise include but are not limited to things like a lost vacuum seal on the package, poor aesthetic appearance of the cut, or poor trimming by the butcher (too much bone or too much fat). 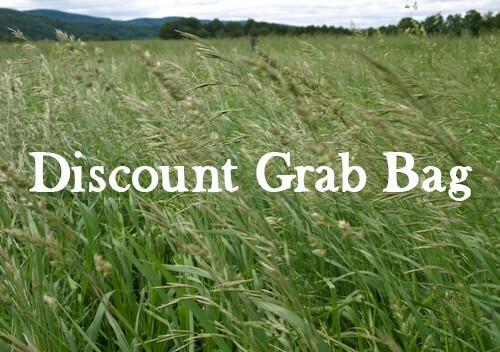 We discount cuts in this grab bag by 30%, or more, off their regular retail price. To purchase $10 or less worth of product order one pound, $10-20 order two, $20-30 order three, etc. We'll do our best to get the total spent close to but still under the amount you want to spend. For example, say you want to try $20 worth of grab-bag discount meat. You will order two pounds and then we'll put whatever we have set aside into your basket. We might fill the order with short ribs with too much fat, and a package of mild Italian sausage with a broken vacuum seal, or maybe three packages of breakfast sausage links and a pack of ground beef, or some oddly shaped boneless pork chops. No special requests can be accommodated in this product. It will just be up to what we have on hand when you order. No soup bones or organ meats will ever be in this product. If you want to try it, we deliver grass-fed beef, grass-fed lamb, pastured pork and pastured poultry to Bryn Athyn PA, Brooklyn NY, and most of Long Island. View our locations.